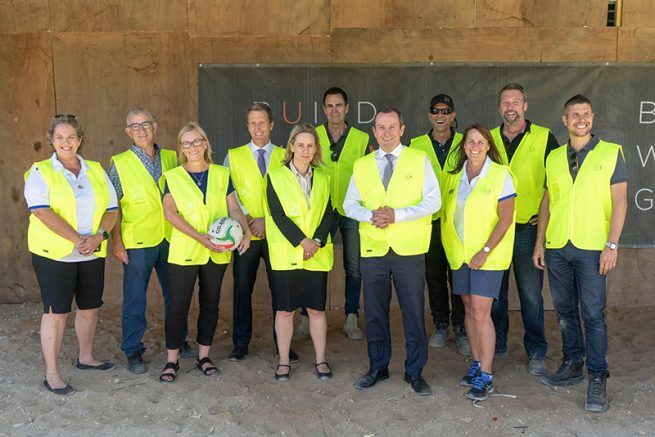 Premier Mark McGowan has visited the southern suburbs’ major grassroots netball facility to inspect the $1.8 million McGowan Government funded upgrades, an election commitment, which will revitalise the iconic club. More than 5,000 participants from across the metropolitan area use the facility each week during the netball season. Western Australian company Buildwell Group is overseeing construction with support from a range of local small businesses and contractors, supporting WA jobs. Located at Gibson Park on High Street, the Fremantle Netball Association is an award-winning club and will welcome a new era when the new facility replaces the previous 60-year-old administration building. The upgraded facility is expected to be completed by April, in time for the start of the 2019 netball season. “The Fremantle Netball Association has provided a home for thousands of southern suburbs netball players over the years, and this new facility will ensure a bright future for the club,” said Premier Mark McGowan. “Gibson Park is an integral part of the electorate of Bicton, and as Lisa O’Malley is a passionate supporter of netball, I’m pleased she has been able to deliver this key election commitment on behalf of her community. State Member for Fremantle Simone McGurk said, “Netball at Gibson Park has been helping create strong, confident and healthy young women in our community for years. “Once the season kicks off in April, thousands of local girls and their families will be down at Gibson Park every Saturday.